The Health Ranger shatters medical fallacies that almost every doctor once believed. Remember when people thought all kinds of fats were bad for your health? That was the same time doctors believed sugar didn’t contribute to obesity. However, everyone knows now that these notions are complete and utter nonsense. It just clearly demonstrates how doctors and scientists can be totally wrong about nutrition and health, despite claiming that they know everything. Mike Adams recalls that the focus of the entire medical industry back in the ’90s was avoiding all types of fat. It was an era when doctors, scientists, and even journalists were all duped into this nutritional scam. They thought avocados, flaxseeds, and eggs were all bad for your health. Today, people know that the “war on fat” back in the ’90s was just a gimmick. This is just one example of how, when influenced by marketing-driven “science,” the entire medical industry has been known to embrace and perpetuate guidelines that are actually detrimental to overall health. They have a history of being wrong, and should not have the last say in everything. The fact that they did, and still do for the most part, suggests how gullible people were (and still are) in believing every word that comes from doctors and scientists. Mike Adams says good fats are vital for the health. A person who does not have good nutritional fat in his diet will have health problems. He has seen this among some vegans who don’t get enough saturated fats coming from animals. It can lead to brain deficiency because the nervous system needs good fats to completely function. But in the early ’90s, everyone thought that eating fat was the only way to get fat. 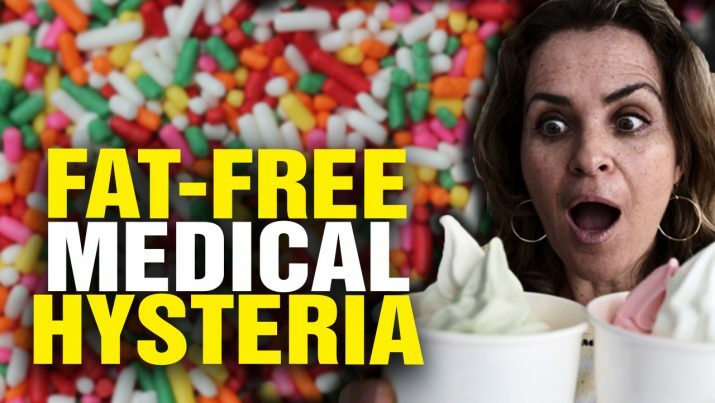 This led to a spike in the sales of products such as “fat-free frozen yogurt.” Technically speaking, these products are not genuine yogurt. They are just low-fat ice cream mixed with some yogurt cultures. The Health Ranger believes that the children who grew up eating frozen yogurt might suffer from cognitive impairment later in their lives. Doctors even encouraged their patients to consume as much sugar as they wanted, believing the ingredient didn’t make people fat. They were completely oblivious of the free radical damage caused by so much sugar. So, there were a growing number of overweight and obese people wondering about their weight gain while eating sugar. They could not comprehend the idea that dietary sugar is converted into fat when consumed. Mike Adams is the author of the #1 bestselling science book on Amazon, Food Forensics. He is also known as the Health Ranger. He has won multiple awards for outstanding journalism and serves as the founder and editor of NaturalNews.com. His science lab, known as CWC labs, has tested over 600 products where he also serves as the lab science director. All of these 600 products can be seen and purchased on the Health Ranger Store. The Health Ranger is responsible for the discovery of more than 11 ppm lead in imported mangosteen powder, and later led a voluntary agreement to restrict heavy metals in rice protein products. It was only a fad. A fad that led average Americans into believing all fats are evil. And who put this idea in their minds? Those who were in the medical and science industries, and their corporate funders. Because why would you stop something that generates profits, right? Adams is amazed by how much our understanding of nutrition and health has changed since the ’90s. Nobody thought so in that era, but today, many things are considered common sense, such as the crucial need for good fats to maintain brain and heart health. This demonstrates how medicine and science can completely change over time. Don’t ever make the misconception that the doctors and scientists of today know everything. They are wrong in many things, such as vaccines. Their lies are swept under the rug. The truth may require another decade to come out before everybody realizes that even doctors and scientists commit mistakes. Always remember that the information supplied by medical and science institutions today may change later. Don’t put too much faith on mainstream media, corporate scientists, and the status quo. Usually, they don’t know what they are talking about, and they bring harm rather than solution.